Duval County (918 sq miles) is close to the Mexican border where the Eagle Ford Shale is present. The Eagle Ford Shale in Duval County has higher gas to oil ratios (GORs) and produces more dry gas than the more active areas to the north. The formation is found at depths of more than 14,000 ft in Duval County . 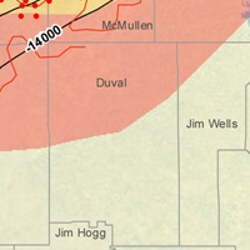 The Eagle Ford Shale is more active as the formation extends into Webb, La Salle, McMullen, and Live Oak counties. The county traditionally produces oil and gas primarily attributable to the Frio, Hockley, Wilcox and Yegua intervals. County services of interest to oil and gas lease owners include theDuval County Appraisal District (tax collector) office and the Duval County Clerk (property records) office. The county seat is the town of San Diego. Other towns in Duval County include Benevides and Freer. Join the Duval County Discussion Group today - your voice counts! EOG Resources has the largest producing operations in the county. Natural Gas Pipe Line Co. of America.